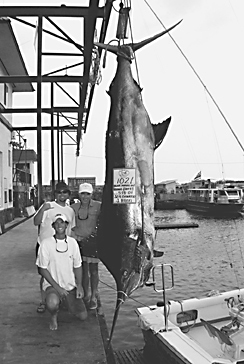 Ramon Flores fought this 1021-lb blue for 1 hour and 25 minutes from Capt. Jerry Allens SEA DANCER, a 31-foot Bertram. The fish attacked a Black Bart lure on an 80-class rig spooled with 80-lb test line.